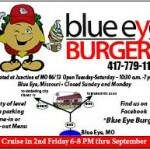 Welcome to Blue Eye Burgers, great food in Blue Eye, Missouri! If you want a delicious burger, make it a point to stop in at Blue Eye Burgers when you’re riding the Table Rock Lake/Three Bridges Loop. They’ve got a great clean little cafe right at the junction of Hwy 13 and Hwy 86. You’ve just got to try their unique burgers and homemade fries. You can carryout, dine-in, or (our favorite) pull up a seat at one of their outdoor umbrella tables and enjoy your meal while you watch the world go by. Plenty of free bike parking. Open Tues. thru Sat., 10:30am to 7pm. Plus, Cruise in the 2nd Friday of every month, from 6-8pm to rub elbows with fellow ride buddies across the Ozarks (all Spring and Summer, thru September). 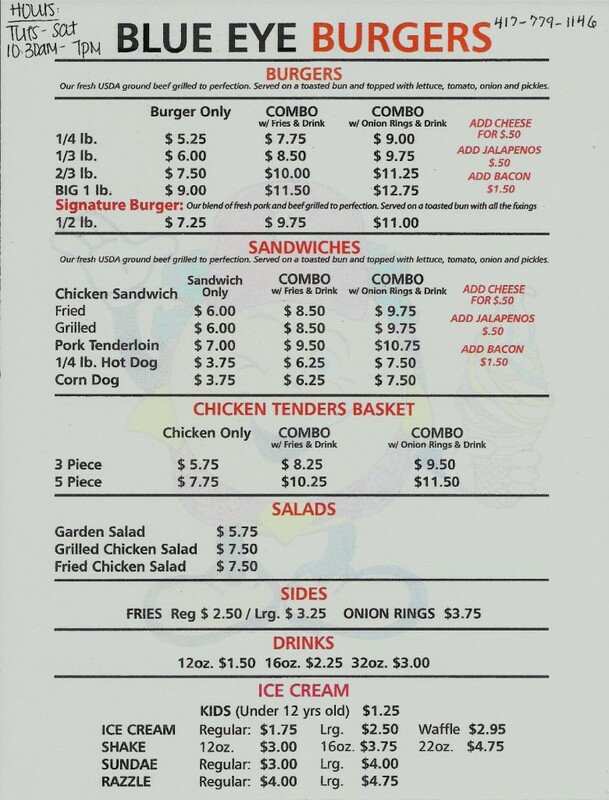 You can find them on Facebook by typing in “Blue Eye Burgers” or you can call ahead at 417-779-1146. Final note: Be careful as you pull into their driveway. They have good, easy access, but they are located at a 3-way stop and traffic gets going pretty fast through that interchange. As always, practice defensive riding and driving when pulling off the road in the Ozarks.